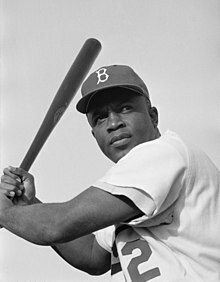 Jack Roosevelt Robinson (31 Januar 1919 – 24 October 1972) wis an American perfaisional basebaw player that becam the first African American tae play in Major League Baseball (MLB) in the modren era. Robinson brak the basebaw colour line whan the Brooklyn Dodgers stairtit him at first base on 15 Apryle 1947. ↑ Landers, Chris (July 24, 2018). "The long and winding story behind Yankee Stadium's Monument Park". MLB.com. Retrieved October 29, 2018. This page wis last eeditit on 23 Februar 2019, at 19:17.